Flooding In Texas Kills 6, With More Rain Forecast : The Two-Way The Brazos River has already reached record levels and forced hundreds of people west of Houston to evacuate. Weather experts predict 4 to 5 more inches of rain around Houston through the weekend. 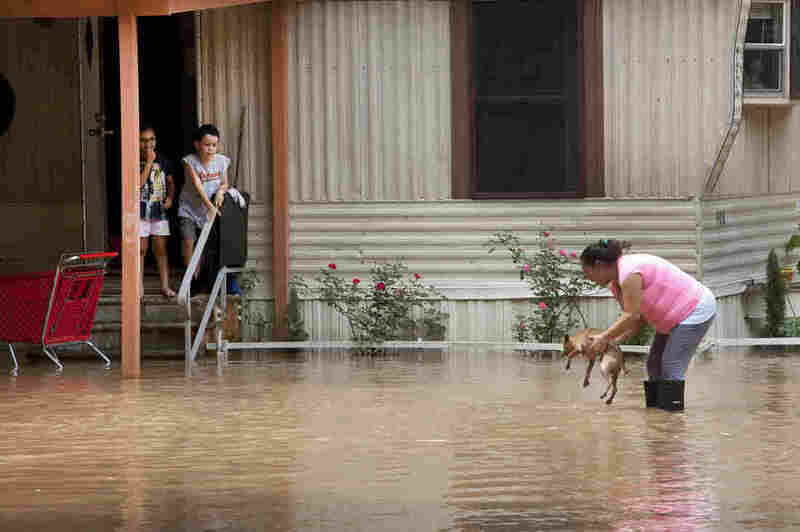 Alejandra Ventura lifts her dog out of the water after the Brazos River topped its banks and flooded a mobile home park in Richmond, Texas, on Tuesday. Days of flooding in southeastern Texas have reportedly killed at least six people, and more rain is in the forecast. The Brazos River, which runs 840 miles across much of the state, has already risen to record levels, submerging neighborhoods west of Houston and forcing hundreds of people to evacuate, according to The Associated Press. The National Weather Service predicts that 4 to 5 more inches of rain are expected around Houston through the weekend. In already waterlogged areas, just 1 inch would be enough to cause more flooding, the service warned. Just two years ago, the Brazos River had run dry in some places due to drought, the AP says. The river appears to have crested at 54.23 feet, an NWS meteorologist tells the news service, but may remain in "major flood stage" for days longer. The historic water levels have damaged hundreds of homes, Al Ortiz of Houston Public Media reports on Morning Edition. Felix Lozano, who lives in Richmond, Texas — about 30 miles southwest of Houston — told Ortiz that his house was filled with 6 inches of water. A neighbor's house had a foot, he says. "Lozano's son, Oscar, says it may be time to find a new home.
" 'I've never experienced what we have experienced this past year, year and a half, with the rains and the flooding,' another Richmond resident said." Last year, around Memorial Day, floods devastated the Houston area. This April, more than a thousand people were evacuated from Northern Houston during another so-called historic flood event. NPR's John Burnett, reporting from Austin over the weekend, said more than 2,000 inmates were evacuated from prisons in low-lying regions and that multiple cars had been washed off flooded roads. "Some students had to sleep in their elementary school when high water prevented buses from taking them home," John said. A flash-flood watch is currently in effect for all of south central Texas, according to the National Weather Service, and a river flood warning is in effect for the Brazos River.